This is the year that global warming and its man-made causes have raced to the top of headlines worldwide, including recently at the United Nations. While not a big greenhouse gas emitter, the small Republic of Armenia -- slightly larger than Belgium -- is facing an environmental challenge of its own, this one largely of its own making. High in the Caucasus mountains, with its green valleys and verdant peaks, unchecked mining is polluting water sources and making parts of this mountainous country uninhabitable. Since independence in 1991, Armenia has dealt with a devastating earthquake, a war with Azerbaijian and blockades on two of its four borders. As a result, it has turned to almost any options it has to generate revenue, including mining and mineral processing. Entire valleys are being stripped of vegetation and life; rivers are being turned into dump sites and the air becoming toxic as well. If carried out responsibly, mining and mineral processing can be important sources of economic growth and development, but this requires that the attendant environmental and public health risks be identified, measured and adequately assessed. Currently there are over 400 active mines. 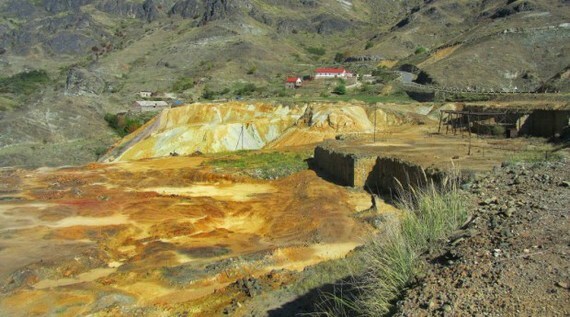 According to Alan Amirkhanian, the director of The Center for Responsible Mining at the American University of Armenia (AUA) 22 of these are metal mines which deposit toxic pollutants into the environment affecting the land, water, and air in nearby communities. Poor monitoring and regulatory enforcement has left these communities exposed to significant environmental degradation and health risks. Toxic pollutants, such as lead, have been detected in unacceptable concentrations in children's blood. These are heavy legacies, especially in such a small country of less than 3 million inhabitants. But help may be on its way. The AUA is teaming up with the young non-profit ONEArmenia, to help stem this danger facing Armenia society and establish a new chapter in sustainable development. They are launching an Indiegogo campaign this week to help equip the university's environmental laboratory with instruments that will detect the presence and level of major pollutants such as lead and mercury in soil and water. This will allow the AUA and its team of leading environmental scientists to carry out precise and accurate tests in all affected communities on a regular basis, thus providing an important evidence-based advocacy and compliance tool. "Knowledge about specific levels and locations of pollution in communities can help plan for remediation. Citizens can also be educated to reduce exposure from soil or water if they know the community sites where pollutants are highly concentrated," says Amirkhanian. One problem, of course is that Armenian industry -- as in most post-Soviet republics -- is run by a few select people -- so-called oligarchs. Corruption remains prevalent and everyday people, still relatively poor, are busy just making ends meet. So to date, environmental issues have taken a back seat. But ONEArmenia Founder Patrick Sarkissian says that the danger is great: "By harnessing the global community's attention on this issue, we are doing our part to drive transparency and responsibility into Armenia's mining industry." The AUA is also planning to train and engage civil society organizations to participate in independent monitoring of pollution in affected communities. Amirkhanian underlines the importance of detecting which metals are present and their effects on local populations: "Once these pollutants are quantified, then we can inform affected citizens of these impacts and find solutions that preserve the health and quality of communities and their environment." None of this comes free, of course. The price tag to buy this equipment is $29,000. Anyone interested in learning more can click here. It may not sound like the sexiest cause, but helping to save the environment is about as important an initiative that one can contribute to. And maybe soon this small republic tucked away in the still breathtaking Caucasus mountains can set an example for the region and start a much-needed environmental revolution.